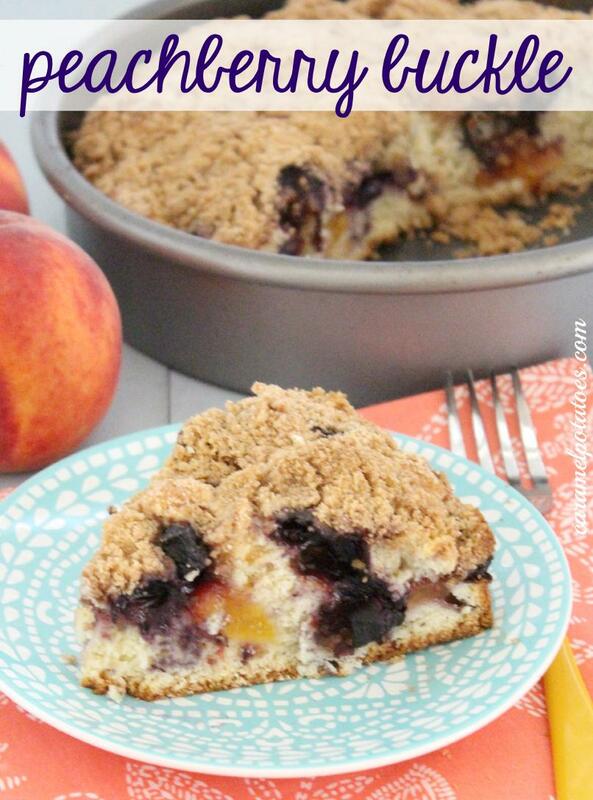 Okay, peachberry is not really a word, but it does exactly fit this fresh cake filled with peaches and blueberries. Don’t you just love the smell of fresh peaches? Anyway you serve them they are a favorite summer treat. 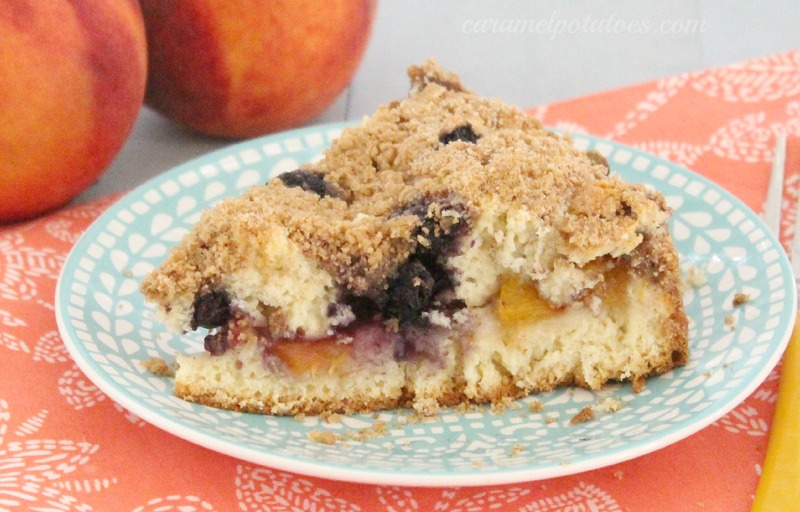 If you are not sure what a buckle is- it is simply a fresh fruit coffeecake. 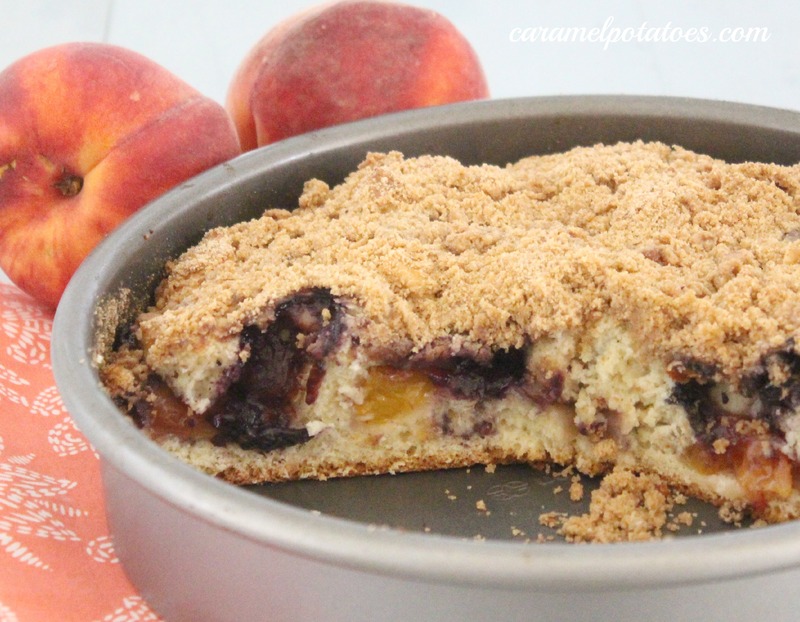 This one is loaded with peaches and blueberries, but any summer berry would be great with the peaches here- raspberries, blackberries, or strawberries . . . YUM! This buckle is fabulous warm from the oven for breakfast or make it ahead for brunch. of course you can always add a scoop of ice cream for a fabulous dessert! Preheat the oven to 350°F. Lightly grease a 9″ round cake pan. To make the cake: In a medium-sized mixing bowl, beat together the butter and sugar. Beat in the egg and vanilla. Stir in the baking powder, salt, and nutmeg. Add the flour in three additions, stirring it in alternately with the milk, and beginning and ending with the flour. Set the batter aside while you make the topping. To make the topping: Mix all of the ingredients until crumbly. Don’t over-mix, or you’ll get a smooth paste, rather than crumbs. To assemble the buckle: Spread half the batter (about 10 ounces) in the prepared pan. Layer with the peach slices. Fold the blueberries into the remaining batter, and dollop it on top; a tablespoon cookie scoop works well here. Bake the buckle for 50 minutes to 1 hour, or until it’s a deep golden brown and a cake tester or toothpick inserted into the center comes out clean. Made this for breakfast and loved it. But I think it was even better the next day. It got more moist. I’ll be keeping this one. I have fresh peaches on my tree and I am always looking for new recipes. Going to try this soon. Oh yes please, definitely with a scoop of ice cream! I love fruit & cake. This looks amazing!!! Thanks for sharing at Sweet & Savory Saturdays #28.